Privacy and fabulous country and sea views. The Rising Sun sits high, looking to the sea, the sunrise and the farmland to Monchique in the north. With 5 bedrooms and 4 bathrooms the accommodation is ideal for large groups or two families with each having a private separate space. 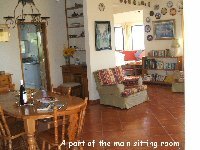 The house is a very comfortable, spacious, private villa with gated free solar heated pool, free Wi-Fi connection and stunning sea and country views. Yet this rural setting is only 1 km from the centre of Lagos. Well equipped, the house is built to the most modern standards with full insulation and double glazing making it cool in summer and dry and warm in winter. We welcome families with children because the layout and comforts are ideal for family groups, but the spaces are designed to be homely for smaller groups. Children have a safe play area with a swing and sand pit as well as games, books, toys. They never leave the heated pool with its shallow play area and slide. 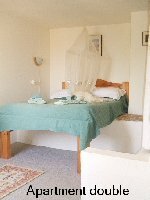 Two cots, two high chairs a baby bath and two pushchairs and a backpack for a small child are included without charge. E-Mail your enquiry for a copy of the twelve years of happy "Guests comments" and lots more information about the house and the Lagos area. 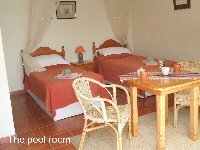 Booking through the owners ensures personal attention to your holiday requirements. The house has free to view English satellite TV, a CD/DVD player, personal safe and a hair dryer. There is a library of paperback books. The comfortable lounge has a log fire. Kitchen : compact and easy to work with a fridge freezer, cooker, dishwasher, microwave, electric toaster, kettle and all crockery, glassware, children's cutlery/crockery and utensils. Guest toilet with a hand basin accessed from the laundry. 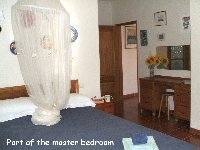 Master bedroom with a double bed and optional air-conditioning. En-suite bathroom with corner bath, shower and bidet. Sliding patio doors to terrace with sea views. Large wardrobes and drawers. 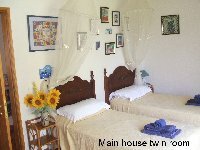 Bedroom 2 with twin beds, optional air conditioning, en-suite shower room with bidet. Sliding patio doors to terrace and rear garden with country views. Large wardrobes and drawers. 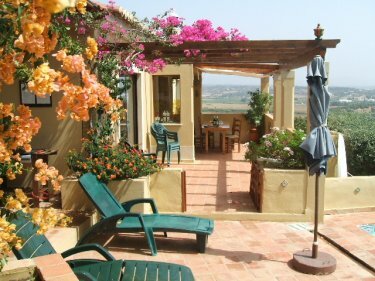 The large sitting room has views to the sea and the Monchique hills and optional air-conditioning. There is a kitchenette with a microwave, toaster, kettle, hob and fridge/freezer and a table and chairs. The sofas can be used as optional beds. The independent main door leads to a small private terrace which benefits from the morning sun. Captain's cabin. Two singles with individual spaces and lovely views complete with porthole and sailors memorabilia. With optional air-conditioning is separated from the house by a covered terrace with traditional tile features. 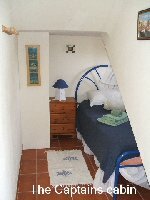 The 30m2 pool room has twin beds, a kitchenette with a fridge/freezer, toaster, kettle, hob and a table and chairs. En-suite shower, toilet and hand basin. Lie in bed with sea views. 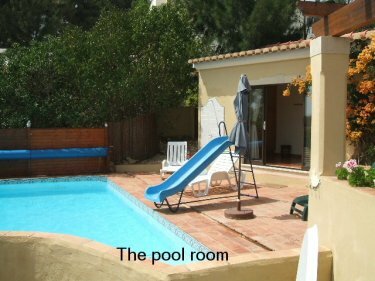 The solar heated pool (9m x 4m) is on the main house level and has a safe shallow area for children and a children's slide. Gates on the main terrace prevent toddlers from escaping. The house is split level with terraces on the main level, including a sun shaded terrace area off the main lounge with an outside dining table. The rear garden has a children's swing, slide, sand pit and climbing frame. 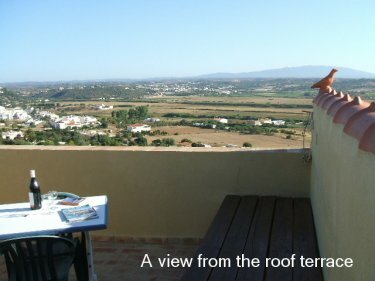 There is a roof sun terrace with panoramic views and sun beds. 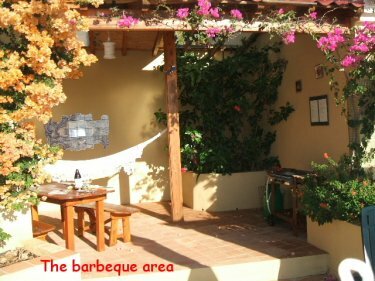 The barbecue terrace is between the main house and the pool room and is equipped with a gas barbecue and a hammock. Sun beds, sunbrellas and outside chairs are provided. On ground floor level is an old well and a terrace for the apartment. There is plenty of car parking space.